Can The IRS Revoke or Block my Passport? | Fortress Financial Services, Inc.
Home » Tax Resolution » Can The IRS Revoke or Block my Passport? If you owe the Internal Revenue Service money, your passport could be at risk right now and you might not even know it. Whether you already have your passport or you have just applied for one, if you travel abroad for any reason then you need to know if your delinquent taxes are about to become an even bigger problem. Don’t get stuck without a passport! It is important to understand what lead to the IRS being able to impact your passport status, whether or not you are impacted, and what you can do about it if you are. This article will cover those issues and give you some idea what to expect. In 2015, Congress passed what was known as the FAST Act, or Fixing America’s Surface Transportation Act. As I explained in another article, found here, the FAST Act included provisions instructing the IRS to take certain actions in order to assist in paying for the cost of the Act. One such provision is that, beginning in 2018, the IRS is instructed to identify “seriously delinquent taxpayers” and certify them to the United States State Department. The State Department is then required to deny an individual’s passport application. It is also then allowed to revoke or limit an individual’s existing passport. What Does “Seriously Delinquent Taxpayer” Mean? A Notice of Federal Tax Lien has been filed and all appeals rights have been exhausted, or a levy has been issued. Once the IRS identifies an individual as “seriously delinquent,” the Service certifies that fact to the State Department. At the same time the IRS makes the certification to the State Department, the IRS also issues a notice to the taxpayer that they have been certified. Thus, the taxpayer has no real opportunity to contest the certification before it occurs, aside from eliminating the tax balance in the first place. 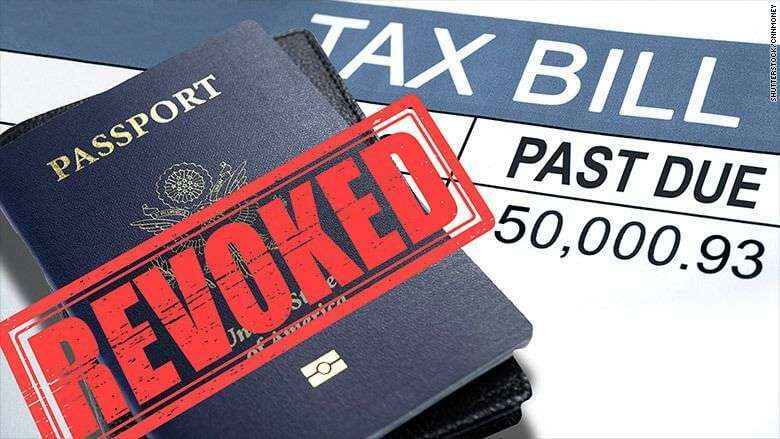 In other words, once you have met the qualifications to be certified a “seriously delinquent taxpayer,” it may be too late to avoid any consequences with your passport. 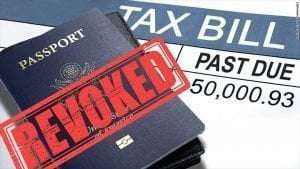 Before going any further, it is important to note that if you are overseas at the time your passport is revoked or suspended, the State Department can still issue you a limited validity passport good only for direct return to the United States. Make an innocent spouse election or request innocent spouse relief and have collections suspended accordingly. Bear in mind, these things need to have occurred prior to the IRS certifying the debt to the State Department as seriously delinquent. This is true for all existing passports. For any application or request for renewal there is, however, a 90-day window of time to resolve the problem. When applying for a new passport or renewal of an existing passport, the State Department will hold your application up to 90 days to allow you to resolve the tax debt problem. Within that 90 days you must sufficiently prove to the State Department that: the debt is not legally enforceable, the certification was in error, you have paid the balance in full, or you have entered into an acceptable form of resolution. If any of those circumstances exits, the IRS will change the status of the certification within 30 days. Has had the IRS accept an adjustment to be made that will satisfy the debt in full. If any of these things is true before the IRS certifies your debt to the State Department, then your passport is safe. On a lighter note, it is nice of the government to make a passport exception for deceased taxpayers! Considering this program is so new, very few people even know the problem exists, let alone whether they know how to resolve the problem before they lose their passport. In fact, the majority of people that qualify as “seriously delinquent” have already received the notices the IRS is required to issue in order to inform them of their rights. Because they were issued before this program began, those notices came without any language explaining the threat of denial, revocation, or suspension of their passport. Worse, the IRS is not going to be issuing any additional notices to those taxpayers as the FAST Act does not require it. So, it is entirely likely that someone who is considered “seriously delinquent” could lose their passport before they even know it is a possibility to lose it. Considering the serious implications in losing your passport, and given the timing issues in getting your case resolved, it is now even more important to consider seeking assistance from a tax resolution professional to assist in getting your case negotiated before it is too late. Time is clearly of the essence in resolving your tax debt. If you do not get it resolved in a timely fashion, you may lose your passport or be rejected when you apply for one. This is additional pressure on taxpayers which may result in feeling compelled to accept an installment agreement they cannot afford. Thus, having a professional intervene and handle the negotiations may avoid the urge to cave when an IRS agent is urging you to accept a monthly amount you cannot afford. If you are concerned that a tax debt may affect your passport or if you simply owe back taxes and need help, we have caring and knowledgeable professionals on staff here at Fortress who will be happy to discuss your situation and how to get it resolved. Just pick up the phone and ask for a free consultation. About John D. Adamson, Esq.